The rally in DC was a success. There were 18 freedom fighters who showed up to help spread the word about Kareem and vocalize their opposition to government-imposed censorship. Foot traffic in the area was moderate, and we handed out around 350 flyers. I had a short conversation with an employee at the Egyptian Cultural and Educational Bureau (where the Free Kareem rally has been held the past three times as well, as the Egyptian Embassy is a bit off the beaten path). I wanted to communicate why were had gathered outside their property. He was surprisingly pleasant and in agreeable about Kareem’s right to free speech because, as he put it, he is a “human being” (he noted that he had himself moved to the U.S. to more fully enjoy his rights). I asked him to tell his colleagues and those he works for that we don’t support Egypt’s policy on this issue. My colleague Drew got some footage from which the attached stills were pulled. I hope to put together a video on Kareem and the larger issue of free speech, similar to what we did for the DC gun ban case and the larger case for freedom in Heller Yeah! Members of Jong VLD, LVSV, Jeunes MR and FEL joined up to protest before the Egyptian embassy. According to the organizer, Philippe De Backer, their action made the national newspapers websites. The rally was a great succes with over 40 participants during the 2-hour protest! Here is a news article covering the event in Dutch. Our great thanks goes to Nicola Iannello, who in his capacity as a university professor and director of the School of Liberal Thought in Rome, managed to get this great rally together in an effort to free Kareem. Special thanks also go to Annalisa Chirico and Giulia Innocenzi (the 2 wonderful ladies in the first photo) who did a great job gathering people to participate in this rally. Many thanks to everyone else who joined and made this possible! 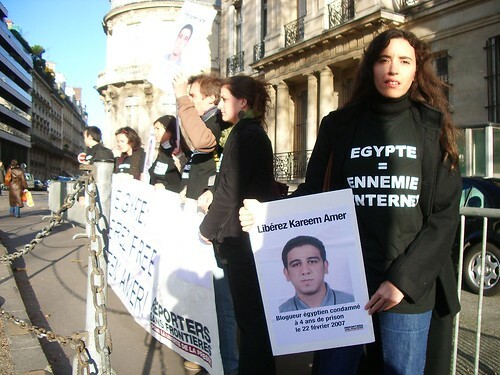 Two of the protestors were allowed into the Egyptian embassy in order to express their concern for Kareem. Below are some photos of the rally that took place in Washington DC in defense of Kareem on the 22nd of February. This is the fourth rally to take place for Kareem in Washington! Big thanks to Jonathan Blanks for the photos and for making much of this possible! And thanks to everyone who made it through despite the uncooperative weather. Below is a picture of the very successfull rally that took place for Kareem in New York on Friday, the 22nd of February. Thanks to everyone who made it! Excellent big banners were created for this event. I am writing to inform you about the Bucharest FREE KAREEM rally, organized by CADI on November 9th, from 12 to 14 pm in front of the Egyptian Embassy in Bucharest, Romania. We are thankful to the 17 people who gathered with us for the “Protest of Silence” meant to show solidarity with Kareem Amer, the young Egyptian student imprisoned for blogging his opinions on the Egyptian state and the Muslim religion. CADI presented the message and arguments of the Silent Protesters in a memorandum also undersigned by Solidarity for Freedom of Conscience, Association Liberalism.ro and CISED and delivered it to the Egyptian Ambassador in Bucharest. - Kareem has brought a personal and public offense to President Hosni Mubarak – an act evaluated as being a serious crime under the Egyptian civil laws. - Kareem also committed crime when he criticized Islam on his blog. An offense brought to the Muslim religion and its icons is an open offense to all the Egyptian Muslims and a violation of their rights. As such, Kareem’s actions escape punishment by the Court. - Kareem also stated falsehood. There are no conflicts between Muslims and Christians in Egypt. - Egypt is a sovereign state; therefore no outsider has the right to interfere with its laws, religion, public issues, policies, court decisions, etc. - Nor should they have an interest. We Romanians should be for example concerned about our crowded streets and advocate for better traffic control. - No one in Egypt or anywhere else is justified to criticize a certain policy or a court decision issued by an Egyptian justice or. Instead, individuals and NGOs have the option to promote legislative change through other means such as party politics. - Complete freedom of expression would cause total chaos, and social nightmare. The Egyptian lawmakers specifically design limitations/regulations in order to protect the citizens against themselves. Abusive free expression attacks persons and religion. - There is no doubt regarding the correctness in the judges’ decision as far as Kareem’s case is concerned. Egyptian judge nor can be suspected of corruption. - CADI’s own act of pressuring is unjustified as we lack sufficient information regarding Kareem’s case. We ought to do more research on Egyptian legislation and Islam and reflect upon it much longer. At the end of the conversation, His Excellency promised to pass on our message to Cairo and assured us of his openness to discussions in any future event of this kind. We thank him in return – hoping that we made some difference in the direction we sought – and leave you to reflect on this piece of debate that stands behind Egypt’s act. We shall continue to militate for Kareem and everyone’s right to express their beliefs. The Coalition will respond to the ambassador’s claims in another post; in the meantime we would like to thank CADI for making their voices heard concerning the grave injustices that Kareem is being put through simply for speaking his mind. Many thanks to the great efforts of Debi Chakrabarty, James Pugh, and to everyone who showed up to this rally in London! Pictures below, followed by an article detailing the event. I send this ‘report’ with a very heavy heart…while all the participants would agree that the London rally was relatively ‘successful’, we are all tremendously saddened by recent news that Kareem is being physically tortured in prison. 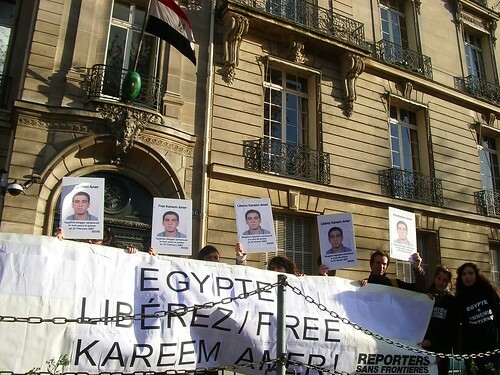 Of course, this strengthens our resolve, and makes us hope, even more fervently, that Kareem is freed soon. The weather may have been cold on Friday afternoon, but the embassy officials were anything but. Although they did close the blinds to the reception area on the ground floor after about 20 minutes, they continued to observe the rally from various windows located on upper floors. Many of them were seen smiling and waving at us from these windows. In fact, some of the male embassy officials seemed to be winking at the (rather attractive) female protesters, which we found more than a little bit odd. Representatives from the London School of Economics, University College London (thank you, Oliver! ), the Oxford Hayek Society (thank you, Andrew! ), Queen Mary, University of London (thank you, Paul! ), IPN (thank you, Caroline! ), Amnesty International (LSE student chapter – thank you for helping us publicize the rally! ), and the freelance journalism/blogging community (thank you, Helen!) were present. 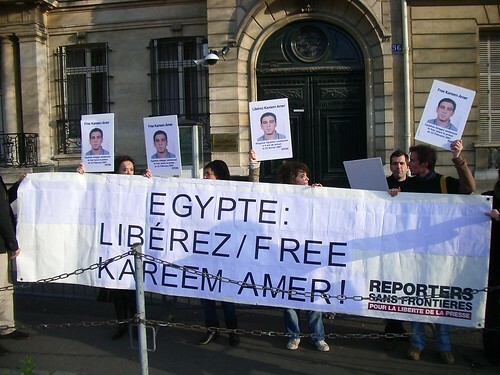 Other individuals who could not make it to the rally (including representatives from IEA and King’s College, London) assured me that they would be participating in the campaign by writing letters, signing petitions, donating money, and doing whatever else they could to help Kareem regain his freedom. The first 40 minutes passed without incident – we chanted “Free Kareem!” every time an official entered or exited the building, with little to no response. A few officials walked out and picked up copies of leaflets detailing the media coverage that we had brought along. Pedestrian traffic on the street was minimal, but the few people who did walk by seemed intrigued by our presence. Some asked for some more literature about the case, which we handed out. A few toddlers looked inquisitively at their mothers for clues about what was going on. One of the most memorable moments occurred when a young [presumably] Muslim woman (wearing a hijab) approached us, smiled timidly, made a “thumbs up” sign with both hands, and quietly walked away. We were fairly sure that she knew exactly who Kareem was and why we were there. What was most galling about his position was his cultural relativism, and his denial of fundamental rights for all people in all places. He seemed to suggest that just as British culture condones the wearing of eye-catchingly short skirts (something that he said he found “offensive”), Egyptian culture condones the punishment of those unlucky enough to be caught saying the wrong thing – and that we ought to ‘tolerate’ that in the way that he tolerated mini-skirt-wearing women in London. We countered the official’s arguments as respectfully as possible, but our protestations that many Egyptians and Muslims supported Kareem’s cause fell on deaf ears. We gently reminded him that Egypt had signed the International Covenant of Civil and Political Rights, and that article 19 (section 2) of this covenant stated, rather unequivocally: “Everyone shall have the right to freedom of expression; this right shall include freedom to seek, receive and impart information and ideas of all kinds, regardless of frontiers, either orally, in writing or in print, in the form of art, or through any other media of his choice”. We told him that the international community, as a result, was watching Egypt’s conduct with a critical eye – but he seemed unfazed. Nonetheless, the official promised us that he would return to his office, read Kareem’s blog again and would consider the issue more fully. We thanked him repeatedly for coming out to speak to us, and we continue to hope that the arguments we made will help influence him and his colleagues to reconsider their position on the case. Thanks to Lamis Khalilova, board of directors of Amnesty Czech, for making this rally possible! Here are some pictures of Friday’s rally! Thanks to Amnesty International at the Czech Republic and to everyone else who participated in this rally! Much thanks to the efforts of Pedro Sette and Magno Karl for making this rally possible in Brazil! And special thanks to everybody who showed up. Thanks again to Pedro, Diogo, and Magno for putting together a great rally.